Festival of the Fires will be officially launched on Thursday April 14th! You are all invited to attend the launch, which takes place at the National Wax Museum in Dublin’s Foster Place at 10.30am. After the launch, in the company of our fabled Uisneach Warriors we are marching to Dail Éireann to invite An Taoiseach and all the political ‘chieftains’ and so-called High Kings to come to the original power base and seat of the High Kings of Ireland – the Hill of Uisneach. We will be presenting Ceann Comhairle Sean Barrett TD with a gift from Uisneach, and afterwards An Taoiseach himself, Enda Kenny, will be cornered and told about our iconic Bealtaine festival. Everyone is welcome to march with us and our Uisneach Warriors on horseback through Dublin City Centre, up Grafton Street and onto the Dail! Ériu Abu! 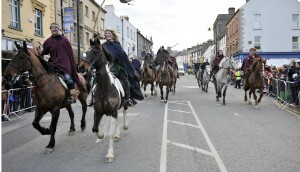 The Uisneach Warriors in Mullingar, photographed by John McAuley. We are marching on the Dáil tomorrow. Ériu Abu! The summer festival season is to be ignited in spectacular fashion over the May Bank Holiday weekend with the return of Festival of the Fires at the Hill of Uisneach in County Westmeath. Presented by Grouse Lodge and David Clarke Livestock the Bealtaine celebration is most spectacular heritage, arts and cultural event of its kind – a festival which unites the country at the dawn of the Summer from its epicentre at the exact centre of the country. The Bealtaine celebration, which is recognised as Ireland’s most ancient festival, takes place on Saturday April 30th and culminates in the lighting of a national fire, firstly on the summit of Uisneach and then carried to every county in Ireland. Over 100 other fires are to be lit nationwide, with all 32 counties joining in this iconic event. The fires follow a dazzling night-time fire parade on Uisneach devised and developed by the multi-award winning LUXe Arts Group and featuring over 1,000 performers and participants. This signature parade is just one of the elements that sets the festival apart from other, music-led events. Of course, music plays a major role and three musical stages will play host to national, international and local acts such as The Saw Doctors, Kíla, Paddy Casey, Republic of Loose, Liam O’Maonlaoi (Hothouse Flowers) agus Rónán O’Snódaigh, The Aftermath, Preacher’s Son, Bi-Polar Empire, The Riptide Movement, Pete Courtney, Comhaltas Ceoltoiri Éireann award winners, Jukebox Gypsy, Touch the Earth, Ronan Leonard, The Revellz, Arrow in the Sky and many, many more. In total close to 100 acts will play. Numerous well-known historians, poets and story-tellers will take festival goers on a journey into the glorious history of the festival venue, the Hill of Uisneach. Heritage trails and guest lectures on the UNESCO World Heritage site are a major part of the event. OAP’s and children are allowed free entry to the event, and a special family area crammed full of workshops, interactive exhibits, slides and kids play areas will keep the young ones occupied. A special Holistic Area will be a haven of tranquillity and peacefulness for people seeking a therapeutic touch and dozens of Holistic Healers will be on hand. Food and drink from around the midlands will be on sale, and local craftsmen and tradespeople will also be showcasing their wares in one of several special ‘festival villages’ which are being established on the hill. The Hill will also come alive with art, and a major arts trail will effectively turn Uisneach into a massive outdoor gallery. Some of the biggest names in Irish art as well as some guests from Europe will be exhibiting on the hill, and an arts competition with a bursary award valued at €5,000 is currently underway. No matter where you go on the expansive site you are bound to be entertained, with secret stages and more dotted throughout the site with ancient Celtic sports, agricultural ceremonies and more taking place in fields along the main heritage trail. The Hill will also be patrolled by hundreds of Uisneach Warriors – horsemen and women dressed in authentic Celtic uniforms. There will also be a special appearance by the Mullingar Town Band, the current European Marching Band Champions, and a theatre stage will feature specially commissioned plays from over a dozen schools. Tickets for Festival of the Fires are on sale now from all Ticketmaster outlets, and from the Button Factory and the National Wax Museum in Dublin. They are also on sale from www.ticketmaster.ie and from selected arts and cultural venues in the midlands. Tickets are €35 each, and tickets with camping are €40. This entry was posted on Wednesday, April 13th, 2011 at 4:13 pm	and is filed under Art and artists, Blog, Festival of the Fires Music, Fire Ceremonies and Parade, Get involved!, Uncategorized. You can follow any responses to this entry through the RSS 2.0 feed. Both comments and pings are currently closed.